Adenosine and adenosine receptors as potential therapeutic targets. Adenosine (Ado) is a nucleoside, composed by the purine nitrogenous base adenine linked to a cyclic sugar molecule of ribose. 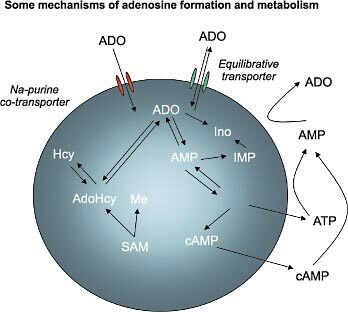 Deriving mainly from the breakdown of the high energy compound ATP and the messenger molecule cAMP , Ado was initially believed to be simply a waste product useful for the purine salvage pathway . However, the finding that this nucleoside can have pleiotropic effects in different tissues and the discovery of specific receptors has brought reconsidering the role of Ado as that of an extracellular signaling molecule involved in physiological, paraphysiological and frankly pathological conditions. As described in the adenosine receptors page , its effects on cells are mediated not only by ligand availability, but also by relative receptor abundance. So, for reported basal extracellular concentrations of 30-200 nmol/l, only tissues that highly express P1 receptors can respond. However, Ado extracellular concentration can be modulated by a wide variety of processes and in pathological conditions such as necrosis can raise up to 30 μmol/l, acting on other populations with low levels of (silent) receptors. Ado levels can be regulated both by intracellular and extracellular mechanism, because of the ubiquitous expression on the plasma membrane of equilibrative transporters , namely ENT1 and ENT2 (also known as SLC29A1 and SLC29A2). These transporters are both sensitive to dipyridamole while only ENT1 is sensitive to NMBPR (nitrobenzylmercaptopurine riboside). Their blockade causes a rise in nucleoside extracellular levels. Only some tissues (kidney and small intestine apical membranes) express Na + -dependent concentrative transporters such as CNT1 and CNT2 (also known as SLC28A1 and SLC28A2). Extracellularly, Ado is produced by the breakdown of ATP (and presumably of other nucleotide derivatives, i.e. cAMP and NAD ) by a complex network of ectoenzymes , involving ectonucleoside triphosphate diphosphoydrolases ( CD39 ), ectonucleotide pyrophosphatase/phosphodiesterases (ENPPs, mainly PC-1 ), ecto-5’-nucleotidases (CD73 ) and alkaline phosphatases . So, there is some kind of negative feedback mechanism between ATP release and degradation to Ado and their often antagonistic actions. For example, in haemostasis ATP and ADP are released and foster platelet aggregation , while Ado inhibits it. In the immune system, ATP stimulates the response while Ado acts as an immune suppressor molecule. In the nervous system, while ATP is linked with neurotransmitter release, Ado inhibits it. Ado effects on different tissues and in different situations is mediated by the specific P1/Adenosine receptor family members. These effects vary, among others, from sleep/wake regulation to immune modulation, to vasodilation and inhibition of platelet aggregation (for a more complete list see the adenosine receptors page and related references). The presence of different receptors and their involvement in different pathophysiological conditions (autoimmunity, cancer, neurodegeneration…) has led to an increasing interest in the possibility to modulate the adenosinergic pathway through more or less specific agonists/antagonists of the receptor subtypes. Adenosine : for the treatment of supraventricular tachyarrhythmia and for imaging of coronary artery disease in patients unable to exercise. Half-life: 30 sec. Dipyridamole : as a vasodilator and against thrombus formation, through several mechanisms: inhibition of Ado reuptake, inhibition of ADA, inhibition of phosphodiesterase, inhibition of TXA2 formation. The knowledge of the different steps leading to Ado production and action and their role in pathology and physiology may result in the development of new therapeutic approaches more effective and with less side effects.